So dramatic was the growth of the Australian wine industry through the 1980s and 1990s that much of the foundation research that made this expansion possible has disappeared beneath the avalanche of its own success. Until recently wine was one of Australia’s fastest-growing export industries, yet only four decades ago very little table wine was even made in Australia. The wine-grape industry was primarily a producer of sherries, ports and other fortified wines. Only limited quantities of wine were exported, yet predictions have been made within the international wine trade that by the middle of the twenty-first century Australia could be one of the world’s largest producers and exporters of premium wine. The transformation, already, has been little short of a revolution, and stems essentially from three crucial research decisions made in the mid-to-late 1960s. They were made against opposition, mostly from agriculture departments which believed CSIRO had no place in horticulture or viticulture, and they were the actions of one man – a feisty plant physiologist named John Possingham. The initiatives he stubbornly pushed after being appointed Officer-in-Charge of the Commonwealth Research Station, a CSIRO outpost at Merbein, Victoria, in 1962 were the introduction, for research, of improved vine stocks from all the main wine-making countries in Europe, plus new virus-tested varieties from the Davis Campus of the University of California; the development of new nematode-resistant root stocks, and most significant of all, mechanical harvesting and pruning. When combined, Australia in a few short years had new, improved vines bred to produce premium wine grape varieties under Australian conditions. In addition, the industry could also take advantage of Australia’s large areas of irrigable land, particularly along the River Murray where the expansion began. Fortunately for Possingham he had an important ally on the Executive, Walter Ives, a shrewd economist who had also been a strong supporter of dissident pastures researcher Jack Davies. As soon as he was given the go-ahead, Possingham sent one of his staff, Peter May, to the US to try to acquire the prototype harvesters. A degree of mystery shrouds the actual ‘negotiations’, but the speed with which they were suddenly en route to Australia still puts a wry smile on Possingham’s face nearly forty years later. The story goes that May convinced the Americans to part with their machines-for no payment, given they were sitting idle because unionised grape pickers had blocked their adoption by industry. May then contacted the CSIRO’s liaison officer in Washington, Clyde Garrow, who had previously been with the CSIRO Division of Protein Chemistry in Melbourne. May told Garrow he had a big machine he needed to get home in a hurry. Garrow had a reputation as a networker and in no time the proto-type Cornell harvester (built by Chisoholm-Ryder, NY) was being wheeled into the belly of an RAAF Hercules transport plane. The other prototype harvester, from the University of California at Davis, (built by Up-Right Inc, California), was put on a ship to Melbourne. A period of intensive experimentation followed at the Merbein research station mainly (a) to test overall feasibility of machine harvesting, (b) to evaluate the relative merits of horizontal and vertical shake harvesting and (c) to evaluate the systems of vine training associated with their use. Soon after, a representative of one of the American companies arrived to re-claim one of the machines, which the company had a licence to market. Possingham agreed to return the disputed prototype, but the upshot was the American company ended up shifting its manufacturing to Mildura because Australia became the first real market. The early Chisoholm-Ryder machines were vertical shake machines, with later models removing the grapes by horizontal shaking against the foliage. The original Up-Right harvester, as used by CSIRO, also employed a vertical impactor. It was replaced on the market by a completely redesigned model, a convertible machine that could incorporate a vertical impactor, a horizontal shaker (similar in design to the Chisholm-Ryder OW model), or a transverse impactor, which shakes the foliage by rubber fingers moving in an elliptical, horizontal path. In 1970, Patterson Engineering Pty of Mildura, Victoria, Australia, built a prototype machine which harvested one half of a row during one passage. It was basically one half of an Up-Right vertical impactor unit and could be mounted as a saddle on a standard Ford 3000 tractor which provides the power for the hydraulic system driving one set of impactors, an over-the-row conveyor and a fan. It was launched on the market in 1973. The Chisholm-Ryder and Up-Right machines straddle the row and harvest all of the fruit in one passage. Fortuitously, the work being done at Merbein caught the attention of French viticulturalists, from whom Possingham was keen to acquire premium vine stocks. It became a valuable relationship. The French were the next to adopt mechanisation, and in turn became an important supplier of vine cuttings to Possingham. 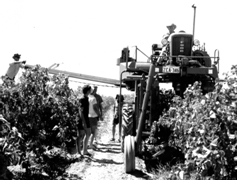 The prototype harvesters had been working on the Merbein research station for two or three years when in the late 1960s there was renewed interest in wine-making along the River Murray – the location of a successful, but brief table wine industry in the 1880s and 1890s before the vines around Rutherglen and the eastern end of the Murray were wiped out by the insect, phylloxera. Several new, large vineyards were planted, but a shortage of pickers looked like bringing the latest venture to a premature end. Possingham, by now absolutely convinced of the value and feasibility of mechanisation, threw himself into promoting his ideas among vineyard managers. The concept of mechanised vineyards caught on and was rapidly cemented as the new way to prune and harvest vines on large acreages. It allowed the Australian wine industry to be the first to be able to think big. In the early 1970s in the South Australian Riverland, companies like Yalumba, Tolleys and Orlando started planting 200- to 400-hectare vineyards, which would have been inconceivable without mechanical harvesting. The imported vines were established at Merbein and their performance under Australian conditions tested as part of the long-term vine breeding program Possingham had set up at Merbein under Alan Antcliff. The aim was to breed grape varieties that were suited to hot inland irrigation conditions. The cuttings were given also to state agriculture departments to multiply up and develop further for growers. Possingham believed this was perhaps the CSIRO’s most important contribution to the development of the Australian wine industry, although he emphasised that he had imported the vines for research, not with any intention to directly assist a new industry. This was left to the agriculture departments which became the main drivers of change within the industry. However Alan Antcliff did breed a light red wine variety called Tarango, which became a successful seller for the winemaker, Brown Brothers. He also released a white wine grape Taminga that has had limited success, and two drying varieties that are widely used. The final achievement, as far as opening the gate to the wine industry’s future by Possigham’s group was Max Sauer’s application of the imported Ramsey rootstock – the basic rootstock onto which the different wine grape vine varieties are grafted. This vigorous rootstock is resistant to attack by nematodes (a serious problem for vines in many sandy Australian soils), the troublesome phylloxera insect, and it is also salt tolerant. As groundwater salinity rises, this one development may yet become one of the CSIRO’s most significant contributions to Australian viticulture. Even in 1991 it was estimated the increased productivity resulting from this rootstock research was worth about $9 million a year. Against this, total research expenditure had been about $720 000 by CSIRO plus about $300 000 by agriculture departments. ‘In your editorial, 13 / 9, you state in part, ‘One of the most valuable strengths of the CSIRO is its ability to channel research energy to national problems’, but there is another aspect: If the wine industry experience is typical, ordinary mortals have no conception of what could be – only the true scientists have the imagination, but they need space. John Possingham is nationally and internationally recognized for his contributions to the Australian wine industry. He was elected: Fellow of the Australian Academy of Technological Sciences and Engineering (FTSE) in 1979, Fellow of the Australian Institute of Agricultural Sciences (FAIAST) in 1997, Member of the Russian Academy of Agricultural Sciences in 1992 and Life Member of the International Society for Horticultural Science in 2002. He was made a Member of the Order of Australia (AM) in 1990, and awarded a CSIRO Medal for Research Achievement in 1992, the Sir Ian McLennan Achievement for Industry Award in 1994 and a Centenary Medal in 2001. Collis B, 2002, ‘Golden Vines’, in Fields of Discovery, Australia’s CSIRO, pp 242-248, Allen & Unwin, Crows Nest, NSW, Australia; which has been edited for the above account.